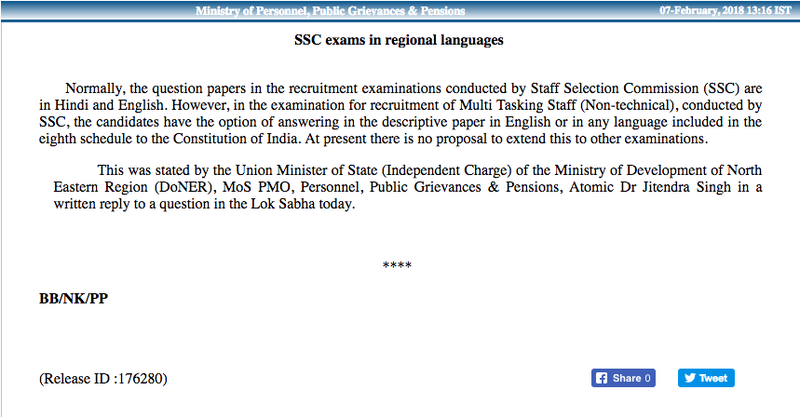 Normally, the question papers in the recruitment examinations conducted by Staff Selection Commission (SSC) are in Hindi and English. 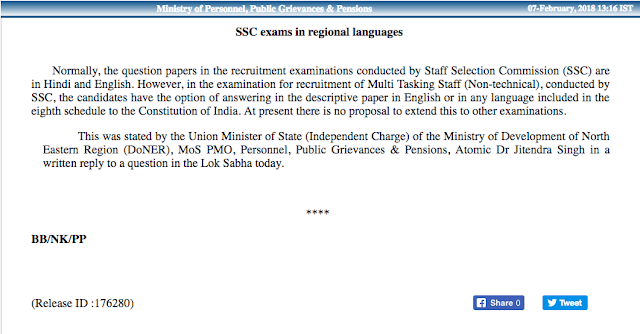 However, in the examination for recruitment of Multi Tasking Staff (Non-technical), conducted by SSC, the candidates have the option of answering in the descriptive paper in English or in any language included in the eighth schedule to the Constitution of India. At present there is no proposal to extend this to other examinations. This was stated by the Union Minister of State (Independent Charge) of the Ministry of Development of North Eastern Region (DoNER), MoS PMO, Personnel, Public Grievances & Pensions, Atomic Dr Jitendra Singh in a written reply to a question in the Lok Sabha today.